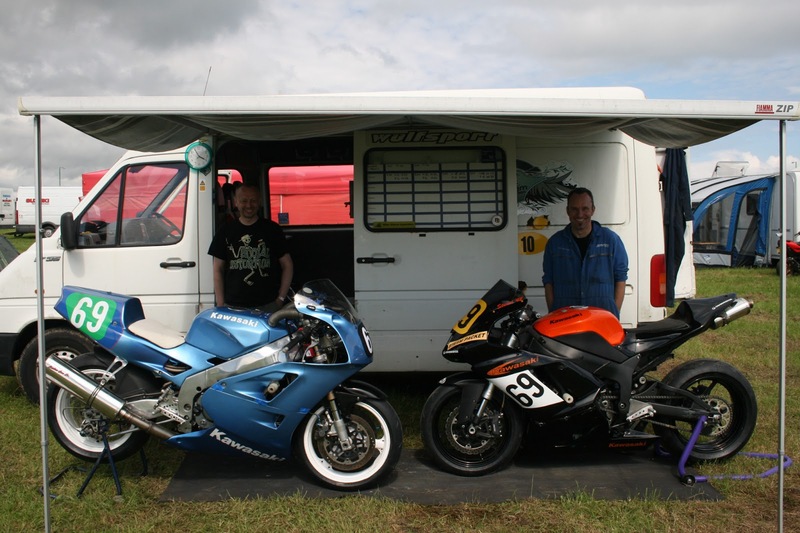 Well first races of the season are now confirmed, so thats Cookstown 26 & 27th April and Tandragee 3rd & 4th May. Before that I've got a track day booked at Castle Combe on 12th April where I hope to run my freshly built engine in, providing I get it rebuilt in time. Castle Combe is a great track day as the TT racers use the circuit to get the suspension set up, as its the track in the UK most like the Mountain circuit, so should be good enough for a base setting for the Irish roads as well. Its all moving along very quickly now, apart from the engine rebuild but it will get done I'm sure. 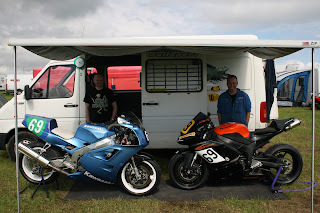 Above is another picture taken by Stuart at this years Southern 100 of both my bikes and my own Mr Motivator, Stafford. Not only does he give great motivational talks, 'you just need to be 3mph quicker everywhere', but he's also an expert at lockwiring, and makes a mean corned beef wrap.